Ruth L.S. Dickson died Tuesday April 3, 2012. She was born in Birdsboro, PA to Martha and Walter Sherer. She was preceded in death by her husband of 57 years the Rev. Robert G. Dickson and her sister, Elsie S. Shenk. She is survived by her daughter Deborah D. Barnes and husband Victor G. Barnes (Rod), her granddaughters Sara Gordon Stellges and husband Brandon N. Stellges and Jennifer Kay Jones and husband Ronald B. Jones, her great grandson, Parker B. Jones, her brother in law Willis W. Shenk, nephews John David Shenk, David H. Dickson and wife Paula, Peter D. Dickson and wife Janet, John S. Dickson and wife Mary and Andrew T. Dickson and wife Lori. A graduate of East Hempfield High School, Rider University, and the New York Chapter of the American Institute of Banking, Ruth was employed by New Brunswick Savings Institution and later as Treasurer of the Particular Synod of New York, Reformed Church in America. Ruth was an ordained elder in the Reformed Church in America and served in the Reformed Church in many capacities with a particularly interest in the role of women in religion and life. Since retiring back to Lancaster County, she has been a docent at Landis Valley Farm Museum and North Museum, a volunteer tax preparer with the VITA program, and a member of the Board of Directors of Quest for Learning. She and her husband co-chaired the Library Committee at Homestead Village and she continued in this role after her husband’s death until this past year. 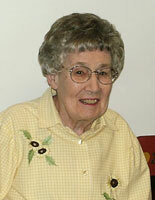 She was a member of the Iris Club and an associate member of First Reformed United Church of Christ. A memorial service celebrating Ruth’s life will be held at 2:00 pm Friday, May 18, 2012 at Homestead Village, 1800 Village Circle, Lancaster, PA with the Rev. David Longenecker officiating. The family asks that in lieu of flowers, contributions be given to Homestead Village Endowment Fund, The Library Fund at Homestead Village, Lancaster, PA or First Reformed United Church of Christ, Lancaster, PA.